Cellulitis is a bacterial infection, which affects the skin as well as the underlying tissues. It might appear in areas where the skin has been torn open, which include the likes of surgical wounds and the skin near ulcers. It is a rather common infection and is spread by the bacteria which enter the skin. Usually, the Streptococcus and Staphylococcus are the bacterial species which cause the disease. The most common bacteria causing the infection are groups A, B, C, G and F of beta – haemolytic streptococci. The resulting infection can further cause redness, warmth (making the swollen region hot and tender towards touch), swelling and pain. The swelling or redness usually spread rapidly. A superficial form of cellulitis known as the erysipelas is cause by streptococci, characterized by bright red, hot area circumscribed on the skin with a border which is sharp and raised. It is more commonly observed in children. In most of the cases, the affected skin belongs to the lower part of the legs. Yet, the infection can occur at any part of the face or body. The infection can also spread to the bloodstream and the lymph nodes. If not treated in time, it can spread to become life threatening as well. In case any symptoms are noticed, medical help should be approached, immediately. Cellulitis is not a contagious disease. As it is an infection of the deeper skin layers (namely, the dermis and the subcutaneous tissue). 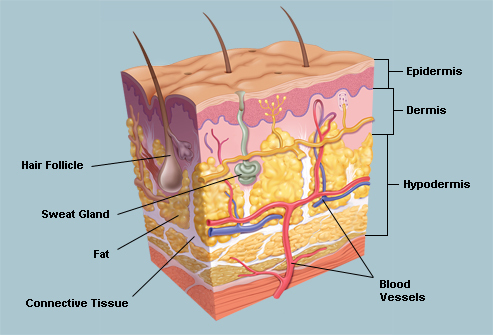 The outermost layer of the skin (called as epidermis) provides a cushion or cover above the infected site. This differentiates cellulitis from impetigo, which is a contagious infection of the superficial layer of the skin. Cellulitis symptoms – How to detect the disease symptoms? Characteristic symptoms and signs are a feature of cellulitis. The beginning of infection is as a small area which swells, becomes tender and reddens. This spreads slowly to the skin in adjacent regions. The skin in the area feels warm on touch. Fever, chills, sweating, tenderness may develop and swelling of glands (lymph nodes) may occur in the region near infected skin as the red area enlarges. Any part of the body can be affected by cellulitis; the most commonly infected are the legs. Usually, the lower leg is the site of infection, particularly the region of the shinbone or the tibia and the foot. Then, the infection can also occur at other body parts like the arms, head and the neck. In some special circumstances, which include post trauma or surgery wounds, development of cellulitis can occur in the chest and abdominal areas. People who suffer from morbid obesity have high chances of developing cellulitis in the abdominal skin. The location of cellulitis is also indicative of its type. For instance, there is buccal cellulitis – cheek, perianal cellulitis, periorbital cellulitis – surrounding the eye socket and facial cellulitis. The signs of cellulitis comprise of warmth, tenderness, swelling and redness, often accompanied by pain in the tissues involved. Any ulcer or wound in the skin, exhibiting these signs can indicate development of cellulitis. There are also certain other non – infectious inflammatory infections that mimic cellulitis. For example, ndividuals who have poor blood circulation in the leg area can develop scaly red regions on their ankles and shins. This infection is termed as ‘stasis dermatitis’ and often confused with cellulitis, which is a bacterial infection. A major chunk of cellulitis infections is caused due to the invasion by Staphylococcus or Streptococcus species of bacteria. The most common cellulitis causing bacteria are groups A, B, C, G and F of the beta – haemolytic streptococci. A superficial form of cellulitis known as the erysipelas is cause by streptococci, characterized by bright red, hot area circumscribed on the skin with a border which is sharp and raised. It is more commonly observed in children. There is also a strain of Streptococcus bacteria, commonly termed as the “flesh – eating bacteria”, which can sometimes lead to the rapid destruction of the tissues underlying the skin. The Staphylococcus aureus bacterium, inclusive of the MRSA (methicillin resistant strains) is another common cellulitis causing bacteria. There has been an ever increasing incidence of infection acquired from the community due to the MRSA (methicillin resistant S. aureus). This is a comparatively dangerous form of the bacterial specie and exhibits resistant to a number of over the counter antibiotics, including methicillin. Hence, it is an infection, more difficult to treat. Many other types of bacteria can also cause cellulitis. Children, who are younger than 6 years, can suffer from cellulitis caused by H. flu (Hemophilus influenza) bacteria. This infects usually, the regions of face, upper torso and the arms of the child. Can you get cellulitis from animal bites? Bites and scratches of dogs and cats can lead to cellulitis caused by the bacterial specie Pasteurella multocida, having an extremely short incubation period of only four to 24 hours. Other bacterial species causing cellulitis which develops after exposure to sea water or freshwater are Vibrio vulnificus and Aeromonas hydrophilia. After a puncture wound, cellulitis is caused by bacterium Pseudomonas aeruginosa. Though cellulitis can be classified as a treatable condition, to eradicate the infection, antibiotic treatment is necessary. It is essential for avoiding complications and the spread of infection. Consumption of oral antibiotics can effectively treat most types of cellulitis. At times, intravenous antibiotics and hospitalization is required in case the desired effect is not achieved from oral antibiotics. A serious complication of the cellulitis infection can be sepsis. The occasional spread of cellulitis to the bloodstream can lead to serious bacterial infection if proper treatment is not given. 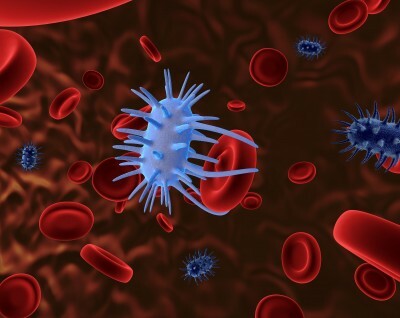 The infection of the bloodstream spreads through the body and is termed as sepsis. A physical and medical history exam is conducted by the doctor. Primary care specialists, inclusive of the family medicine specialists as well as interns treat cellulitis. The patients seeking treatment in an emergency department or the urgent care centre, the treating physicians may be emergency medicine specialists. In some extreme cases, there may be need to involve surgeons and infectious disease specialists for the treatment of cellulitis. First of all, it is essential that the doctor must distinguish whether the inflammation is caused due to a cellulitis infection or not. The medical history as well as a physical exam of the patient provides clues regarding the same. Sometimes, the white blood count can be used to diagnose cellulitis. A culture or bacteria can also be of great importance and value. Yet, in a number of cases of cellulitis, the concentration of the bacterial cells and colonies may be low and might fail to demonstrate and indicate the causative organism. In such situations, antibiotics designed to eradicate the most likely bacterial species to cause the particular form of infection, may be commonly used for the treatment of cellulitis. In cases where abscess is present, the typical need is of a surgical drainage. There are other cases, when the doctors might not be able to distinguish between inflammation caused due to the infection or otherwise. Just to be sure in these situations, antibiotics are prescribed to the patients. In situations where the condition or the inflammation does not exhibit the desired response to the antibiotic, different methods to deal with types of non – infection inflammations may be deployed to address the situation. For example, corticosteroids can be used for the treatment of an infection suspected to be due to an autoimmune disorder. Class I patients have no signs and symptoms of systemic toxicity, have no uncontrolled co-morbidities and can usually be managed with oral antibiotics. Class II patients are either systemically ill or systemically well but they have a co-morbidity such as chronic venous insufficiency, peripheral vascular disease or morbid obesity which may complicate or delay their infection recovery. Class III patients may have a significant systemic upset such as acute confusion, tachypnoea, tachycardia, hypotension or may have unstable co-morbidities that may interfere with therapy response or have a limb threatening infection due to vascular compromise. Class IV patients are those with sepsis syndrome or very severe life threatening infection such as necrotizing fasciitis. Clinical findings alone are usually adequate for diagnosing cellulitis, particularly in non-toxic immunocompetent patients. Class I patients can usually be managed with oral antibiotics. Class II patients are suitable for short-term of about 48 hours hospitalisation and discharge on outpatient parenteral antimicrobial therapy (OPAT), where this service is available. Class III and Class IV patients require hospitalisation until the infected area is clinically improving, systemic signs of infection are resolving and any co-morbidities are stabilised. Patients with suspected necrotising infection require urgent surgical assessment and extensive debridement of the affected area. Antibiotics including the penicillin derivatives or any other types of antibiotics which are effective against the bacteria responsible are used for cellulitis treatment. In case the causative organism exhibits resistance to the chosen antibiotic substitution with other appropriate antibiotics is done. This is also helpful in case of people allergic to penicillin. At times, the requirement of the treatment may be to administer intravenous antibiotics as oral antibiotics might not have proved successful. This is because sufficient penetration of the antibiotic needs to be provided to the inflamed tissues. Administration of intravenous antibiotics can be carried out at an infusion centre or at home as well as in a hospital setting. In all of the possible cases, the choice of treatment is based on a number of factors. The extent of infection as well as its location needs to be taken into account. The type of bacteria is another deciding factor, along with the overall health status and medical history of the patient. In a number of critical cases, hospitalization is necessary. IV antibiotics are administered in requisite doses until the infection is under control and then oral medicines are prescribed to be continued. Surgery for cellulitis is rare but necessary in severe cases. There might be a need for the doctors to cut open and drain the pus or abscess which might have collected in the tissue. To allow healing, sometimes cutting off the dead tissue might be required. Usually, development of cellulitis occurs in the region where the skin might have been torn, like a cut, insect and animal bites small puncture wounds. There may be cases where apparent skin injuries might not be triggers for development of cellulitis. In these cases, the cause can be microscopic cracks in the skin which are irritated or inflamed. Cellulitis can appear in the regions surrounding surgical wounds and ulcers as well. There are other instances, when cellulitis can occur without any skin damage at all. For instance, there is edema or chronic leg swelling. Impetigo or athlete’s foot (tinea pedis) are pre-existing skin infections which can predispose to the development of cellulitis infection. Likewise, psoriasis, eczema, or skin damage caused by radiation therapy are inflammatory conditions of the skin leading to cellulitis. Individuals suffering from diabetes or other conditions like HIV/ AIDS, which compromise the effective function of the immune system or those, who are receiving chemotherapy or consuming drugs to suppress immune response are prone to cellulitis development. Conditions which cut down the blood circulation in the veins or decrease lymphatic fluid circulation, like obesity, surgeries, pregnancy and venous insufficiency also take the risk of cellulitis development, a notch higher. There are certain circumstances, in which, observing proper hygiene, care of cuts or wounds and treating chronic tissue swelling (edema), can help prevent cellulitis. There are others, where the creaks in the skin tissue can be microscopic, not apparent and may lead to development of the infection. In general, it is easy to prevent cellulitis in a healthy person with a strong immunity by avoiding skin wounds. In individuals having weakened immune systems, cellulitis may not be as easily preventable. Keep your skin clean and practise good personal hygiene. Wear well fitting, sturdy slippers or shoes, with cotton socks. If you are outdoors, avoid walking barefoot. Use soap and water to wash injured skin. Make sure that the healing process is no longer than a few days. What is cellulitis of the leg? Is it dangerous? If the patient’s leg is affected by cellulitis, there are chances of the lymph glands in the groin getting swollen or tender. While most cases of cellulitis are mild infections and last for several days to a couple of weeks, cellulitis infection might progress to become a more critical infection. This can even lead to severe illness affecting the whole body, like a sepsis or other dangerous health issues. Timely treatment is necessary for reducing the symptoms as well as controlling the infection. Staphylococcus aureus is a common causative agent of cellulitis. One of the strains of the bacterial specie, which is the MRSA – methicillin resistant Staphylococcus aureus exhibits resistance to antibiotics. There has been an ever increasing incidence of infection acquired from the community due to the MRSA (methicillin resistant S. aureus). This is a comparatively dangerous form of the bacterial specie and exhibits resistant to a number of over the counter antibiotics, including methicillin. Hence, it is an infection, more difficult to treat. Can you get sepsis from cellulitis? Is cellulitis fatal? Sepsis can be triggered in some individuals, due to cellulitis. Often termed as blood poisoning by the general public, sepsis is a dangerous response of the body, to injury or infections. It disables and kills millions and for survival, early suspicion as well as treatment is necessary. 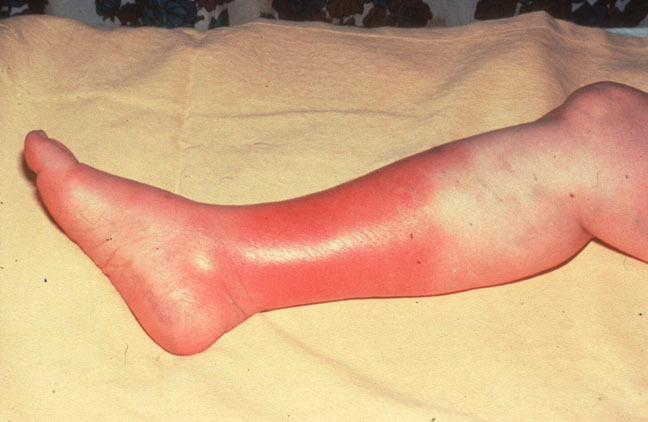 Cellulitis usually infects the lower leg. Here, it can lead to the swelling of the lymph nodes and tendering of the tissue in the groin. Additionally, the infection may spread to the bloodstreams and the lymph nodes if left untreated. This leads to the severe and often deadly blood infection termed sepsis. Infection of membranes surrounding the spinal cord and the brain, termed as bacterial meningitis, is caused due to facial cellulitis. Hence, though cellulitis is a mild infection, it may spread and become fatal. Therefore, timely treatment is necessary. How to clean cellulitis wound? Clean the wound as directed by the physician. Make sure you use antiseptic or soap and water for the cleaning. Also, keep a check on the signs and symptoms of infection or increase of the infection. Diabetic patients have a 30 fold increased risk of low extremity amputation due to infection. Hence, preventing cellulitis becomes highly important. The eventual compromise of the body’s immune system calls for the need to inspect the feet and recognize ulcers which have the potential of becoming infected. In case cellulitis occurs in diabetics, it is generally accepted by clinicians that mild infection can be initially treated with narrow spectrum antibiotics, on an outpatient basis. These act effectively against Streptococcus and Staphylococcus species of bacteria. The same is to be followed with subsequent therapy based on clinical response. Culture results and recent antibiotic exposure also need to be considered. In case the desired effect is not observed from the administration of oral antibiotics, IV or intramuscular antibiotics can be deployed. In cases where the infection fails to respond suitable to the antimicrobial therapy, a vascular surgeon must be consulted. Surgical interventions like procedures of revascularization may be necessary for improving the outcome of the therapy. Herpetic whitlow – What is, Causes, Symptoms, Treatments and Pictures, Is it contagious? Can I mix azithromycin with yoghurt?